Home / About Us / Our Providers / Michael W. Seiberg, D.P.M. "The majority of people have positive results with podiatry and it’s rewarding to help them feel better." Michael W. Seiberg, D.P.M. is a board-certified podiatrist specializing in conservative and surgical treatment of foot and ankle disorders, including diabetic foot care and wound care. He joined Desert Orthopedic Center in October 1994. A native of Northridge, CA, Dr. Seiberg served his podiatric surgical residency at Mercy Hospital and Medical Center in San Diego, CA, and received his podiatry degree from the California College of Podiatric Medicine in San Francisco. He came to Desert Orthopedic Center from a foot and ankle center in Studio City, CA. 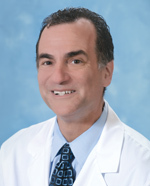 A recipient of the Robert J. Prentiss Memorial Research Award of Mercy Hospital, Dr. Seiberg has been published in his specialty, and has conducted research on the etiology and treatment of bunions, as well as advanced treatment options for non-healing wounds, which he continues here in the desert. He is board-certified by the American Board of Podiatric Orthopedics and the American Board of Podiatric Surgery. He is a member of the American Podiatric Medical Association, the California Podiatric Medical Association and the Coachella Valley Podiatric Medical Association.